Bangkok, Thailand -- The latest controversies involving monks have made many Thai people despair. Is Buddhism deteriorating because of the increasing number of misbehaving monks? Is the Lord Buddha's philosophy failing to enlighten the current generation of monks? Before we all jump the gun, let's dig into the issue and seek the answers in simple dharma. Maybe the scandals are a blessing in disguise, if we adhere to the basic rule of karma - whatever happened, happened for a reason, and is the consequence of our collective actions, of our good and bad karma. Two concurrent cases may seem too cruel for some Buddhists. 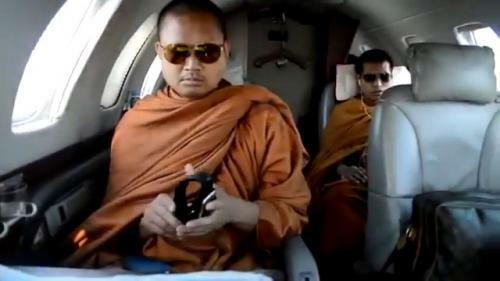 One involves a jetsetting Thai monk, Luang Pu Nenkham, whose behaviour has upset quite a number of people and shocked some. He carries a Louis Vuitton case, flies in a jet plane, often visits big shopping malls abroad, owns many luxury cars and plans to develop a massive property project. In addition, he is accused of having eight wives while still being ordained in the monkhood, and his financial affairs are now being investigate by the Anti-Money Laundering Office. The agency has found that he owns 10 bank accounts with transaction records of up to Bt20 million per day. Another blow was the abrupt departure from the monkhood of Phra Mitsuo Gavesako, who is respected for his dharma teaching book. People were very surprised that the 61-year-old monk decided to leave his monastery after 38 years of practice. They were speechless to learn that he had then hastily married a Thai woman. His marriage certificate and photos circulated by his wife are like salt in the wounds of his followers. Both cases have shaken many Buddhists, and there is nothing any devout practitioner can do but go back to the core of the Lord Buddha's teaching. Had they really paid attention and got to the core of the dharma, neither Luang Pu Nenkham nor Phra Mitsuo's case would have made them upset or lose faith. Considering the case under the law of the Sangkha Supreme Council, it is doubtful that the controversial Luang Pu Nenkham could remain in the orange robes. Yet it is rather different in the Mitsuo case, as he left the monkhood and then got married. There is no wrongdoing here. His departure only has a great effect on people's minds. People assumed he would be a monk for life. But expectation, when it is not fulfilled, can leave us in despair. Many people express their sorrow and frustration about Mitsuo on social media, and many portray his wife as the villain. The thing is, the matter has gone beyond the point of return. "Live in the present," is another of the Lord Buddha's teachings. We may have to re-examine ourselves: if the monk was a car carrying us along the path to enlightenment, the car has broken down. All we have to do is take another car on the same path. Using plain Buddhist philosophy, you detach your thoughts of him as a monk, and move on. Non-attachment is at times a rather tricky Buddhist concept because it seems so easy to follow as a principle; but in reality it can be so difficult to follow. The sadness of losing a teacher like Phra Mitsuo can well demonstrate the consequences of such attachment. "Whenever we attach, we are unhappy, and when we can detach, we are free from suffering," the late Buddhadasa has said. The vicious circle, perhaps, starts with each one of us. Like the case of Luang Pu Nenkham, his wealth and lavish lifestyle are part of the collective karma of Buddhists. Before he reached this point, there were followers who bought him expensive gifts and donations of money. First things first, it is us who took part in the bad karma if that behaviour is sinful. The rude awakening from the scandal goes back to karma's basic rule. There is no "drive-through" or "fast-track" way to heaven, and the value of your merit doesn't necessarily go in line with the cost of it. The greater your desire to go to heaven, the more likely you will be lured to hell. This shows, in the case of followers of Luang Pu Nenkham, that merit, despite its cost, has only worsened the core of the religion. Nevertheless, we should not worry about the decline of Buddhism because of a number of scandals. We have experienced this before with the misconduct of the former Phra Yantra, Phra Nikhon and Nen Air. Despite the struggle against all the vices of today's society, the tenets of Buddhism have survived and are intact. Sometimes we may forget the very simple way to contentment but in hard times like this, Buddhism can still gives us time and space for soul searching. Revisiting the simple principle of non-attachment and other wise Buddhist teachings can be practical and consoling in such situations. As the late Buddhadasa has taught, and it is very applicable here: "Sorrow teaches us more than happiness could."